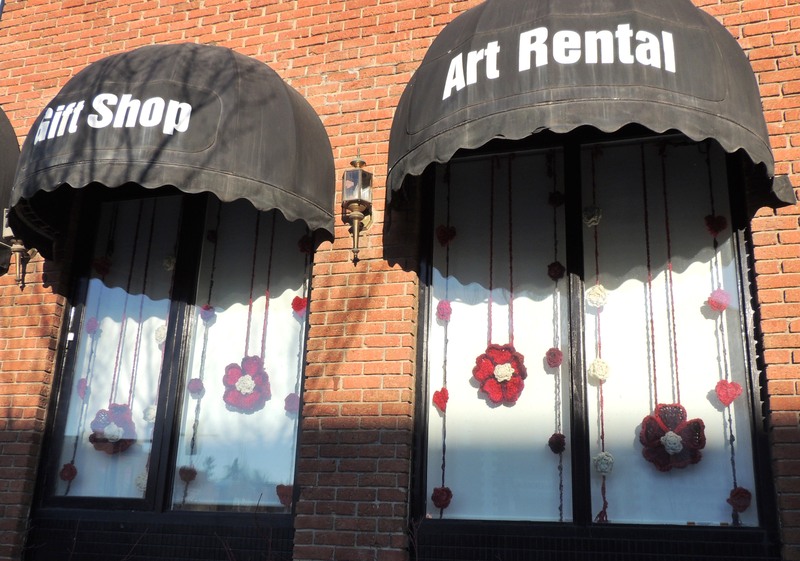 I was recently asked by the Art Gallery of St. Albert to design a fun and bold window display to warm the cold days of February. My thoughts started flowing and I immediately began thinking of ideas that could incorporate both the Valentines theme that warms our hearts and the warmth of the coming spring. With that in mind I chose to work with a colour palette of reds, whites, pinks and purples to enhance the warmth in the overall theme of the display. Today was the set up day which was kind of nerving as you never really know how it will look till you see it in the space it was intended for. Spring forward as the theme, I began by choosing a flower that would be perfect for both Valentines and the coming spring. Roses seemed to be the perfect fit as my main flower since they are one of my favourites and often the chosen flower for Valentine’s Day. Wanting to incorporate hearts in the theme, but not so obvious in some sections, I started making a variety of large hearts. Placed 5 of the hearts together to form the petals of a flower with the centre being a rose bringing the connection of a Valentines theme and Spring Forward together. These are the four large flowers in each window enticing us to look forward to the warmth of the upcoming season of spring. 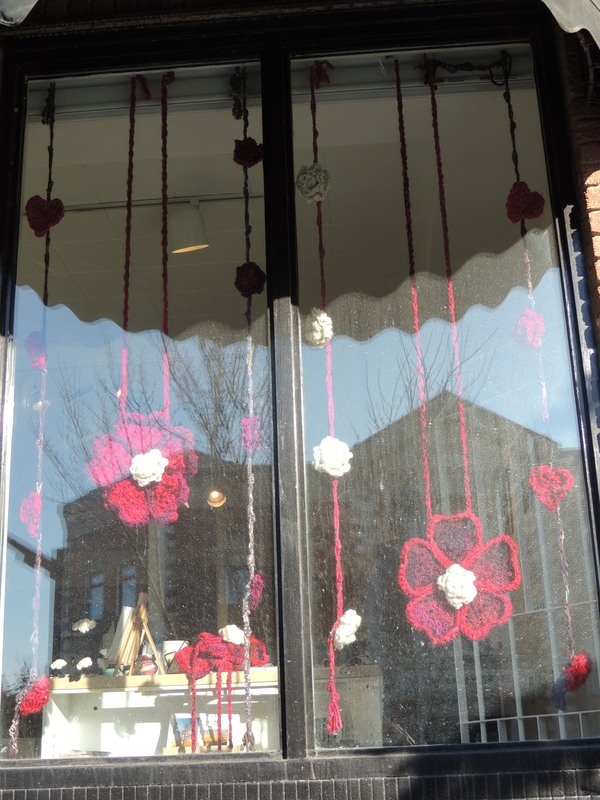 A variety of hearts and roses adorn each of the scarf vines made with various specialty yarns such as hand spun yarn, hand painted merino wool, beaded and sequins silk, kid mohair and on some a crushed pearl yarn. 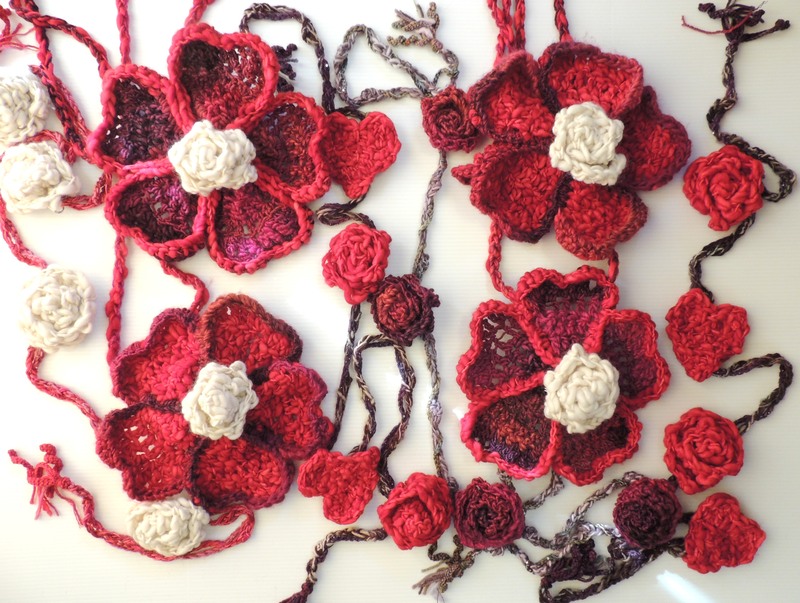 The roses and large flowers are made with a variety of yarns including hand painted merino wool and other fibres. Each of the single hearts hanging on the vines is woven with second yarn of the same colour just as those we love are woven into our lives. Each of the pieces involved in this design, including the flowers and hearts as a brooch, can be reused on other displays and more in keeping with an environmentally friendly design. 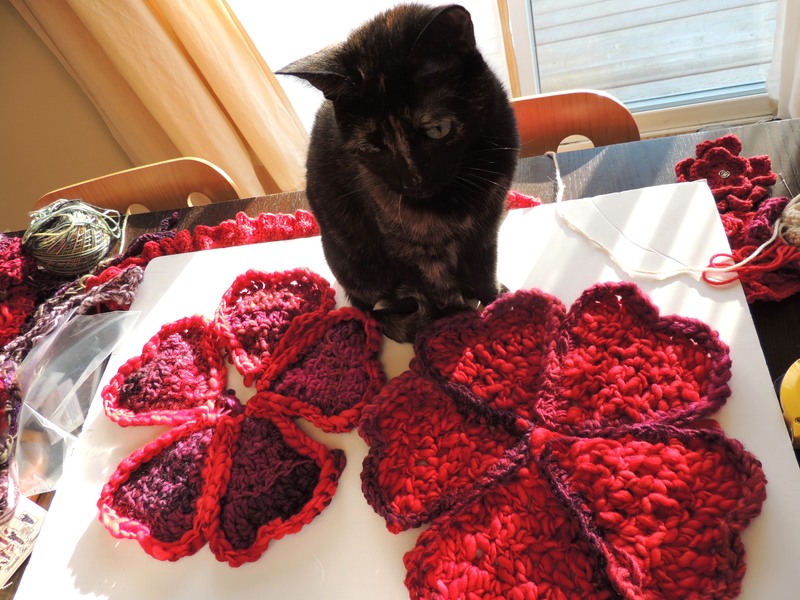 Tiia, one of our cats, is quick to check out how I am doing while working on the design of the Floral Hearts flowers. She is one of those cats with more than 9 lives, always getting in trouble! Nice & bright! I love the hearts (always a favorite of mine) and the roses. Well done! Thanks for your kind comments!! 🙂 I enjoyed working on a larger scale! Looks awesome you are so creative! Thanks!! 🙂 Your too kind!